I am often asked how much of flexibility is natural and how much of it is gained by yoga, stretching and exercise. I wish I could provide a definite percentage, but in truth, it is very individualized. Your "natural flexibility", is determined by the different proteins that make up your body. Collagen is a protein that is like a rope. Elastin is another that is more like a rubber band. Different tissues in your body have different ratios of collagen to elastin making them stiffer or stretchier, and different people will likely have different ratios overall as well. Depending on your mix, you could be more of a rope or more of a rubber band. Rubber bands are stretchier, obviously. Also, some individuals can have conditions that actually affect the proper production of collagen in their bodies making them naturally super stretchy. So how do you know whether you are more rubber band or rope? Your Beighton Score is a quick way to get a general idea of your natural flexibility. Use the quick checks below and give yourself 1 point for each thing that you can do (include both sides)! What does your Beighton score mean? If you score high (3-4), you are naturally more flexible, but your tissue may not be as strong. If you score low (0-2), no worries! This just means you have really strong and stable parts, but it will take a little more effort to gain flexibility. If you score really high, be careful because you may have unhealthy ranges of motion in your joints that can by damaging over time. 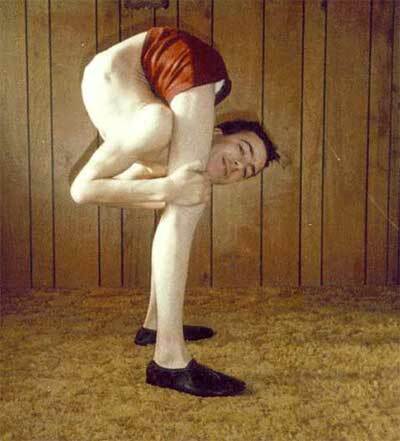 A score of 5/9 is considered very flexy or even possibly hypermobile (excessively flexy). Now remember, no judgment! This is just how you are built. We often value freaky flexibility in yoga, but yoga is not all about flexibility. Yoga is also great for building strength and stability, especially, for you yogis and yoginis that score high on this test. Remember this balance in our practices and teaching.